When Trump promised to end the scourge of illegal immigration, he meant it. Since entering office, he has directed the DOJ and ICE to crack down on criminal aliens. Over the last year, they have conducted sweeps across the country, rounding up numerous illegal aliens. Most of them were either members of dangerous drug cartels or convicted of deadly crimes. Now Trump has official named his permanent director of ICE. This is a man who has no intention of playing games. Homan has run the agency since Obama appointee Sarah Saldaña — the former U.S. attorney in Dallas — stepped down when Trump took office in January. He has been a public face of the administration’s crackdowns on immigrants and border security, a tough talking law enforcement careerist who is unapologetic about being “heartless” when it comes to deporting even the most sympathetic longtime U.S. residents. Liberals and the media frequently try to paint immigration enforcement as some kind of cruelty. Yet Homan and his people are only enforcing the law. The left wants us to ignore the fact that illegal aliens are breaking the law. If we don’t enforce our laws, what good are they? We cannot allow anyone to disrespect the laws of our country, for any reason. It’s why we have such a crisis at the border. Mexico and other nations are laughing at us as they import criminals to our country. 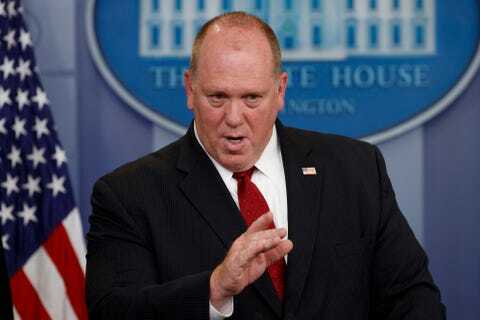 Under Homan, ICE will actually do its job of enforcing the law. Illegal aliens won’t be able to waltz into this country and face zero circumstances. And criminal aliens will face the justice they deserve. In the coming months and years we’ll see the situation turned around. Illegal immigration will drop and the threat of drug cartels in America will decline. It’s about time.